Happy New Year from Lifecrack! Stay tuned for more pro tips from the Tipster in the New Year and be sure to check out some new posts by the Techninjo. Finally, sorry about our New Year's NBC special not getting aired... we'll explain that all in a future post. 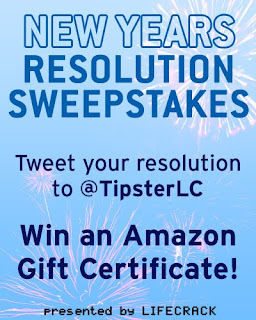 Also, we didn't receive any entrants in our New Years Resolution Sweepstakes, so its been extended until 2012!! Step 1 - Unfriend everyone on Facebook and switch to My space. This way everyone will know that I am on Myspace when facebook closes. Step 2 - Keep tweeting to everyone to warn them about facebook. Now that I have 36 followers on Twitter, this should be pretty effective. Step 3 - Find out how I can access Myspace without an internet connection. I know that this is a big problem with Facebook, but I assume Myspace has this taken care of. If anyone can help, I'd really appreciate. Just leave a note in the comments are tweet me @Iamlifecrack ! Hope this helps everyone, let me know if you are going to take these steps as well. Before I go to bed tonight, I thought I'd share with you all three tips on how to get a better rest. So, without further to do, here they are! Tip #1 - Get a comfortable pillow. The pillow is where your head spends most of the night. Therefore, it is one of the most important things. Tip #2 - Make sure your room is a comfortable temperature. If your room is too hot or too cold you won't be comfortable and wont' sleep as well. Tip #3 - Don't use an alarm clock. Alarm clocks often interrupt your sleep, they are a bad idea. If you need to get up early, you should go to bed earlier. I hope these tips were helpful! Remember, sleep is a marathon, not a sprint so try not to go overboard! Top 5 reasons FaceBook will not succeed. MySpace allows you customize your profile however you want! If history has taught us anything, it is that people like animated gifs! Marky "Mark" Zuckerberg fails to realize this obvious fact. You can login to many other websites with your Facebook account (including MySpace), so why would you need to go to facebook.com?? MySpace has better features and more entertaining people, all available just by logging in with your FaceBook information. Facebook was stolen. There's even a documentary out about this. On another note, I must congratulate Mark Zuckerberg. He did a great job acting in The Social Network, Adventureland, and Zombieland! There is a reason so many countries block FaceBook. It is simply not a good website. Facebook can only be access through the internet. This one is pretty self explanatory. We had our 300th visitor today!! I am so happy! Thanks everyone! Thanks to all our South Korean fans! 실수가 여기에있다면 죄송합니다! 그냥 내 사이트를 방문해 주셔서모두에게 감사를 말하고 싶었어! 내가 당신에게 모두 도움이 되었으면 좋겠! 해피 뉴 이어!